Using a tape measure and pencil, make another mark 40mm inside of the previous mark on each side of, the proposed location. 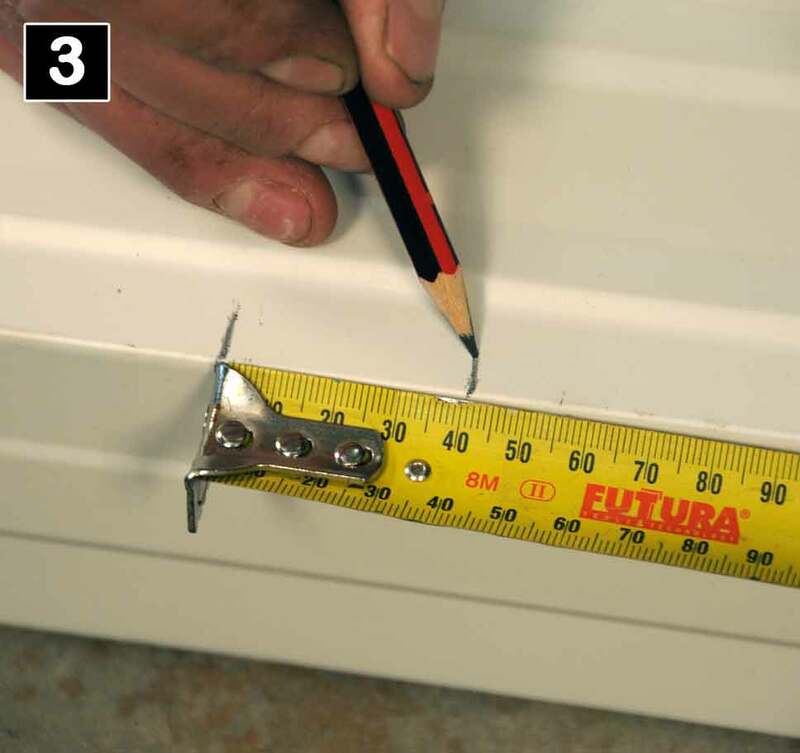 Using a set square, draw a vertical line with a pencil, (from the 40mm inside mark) on each side. 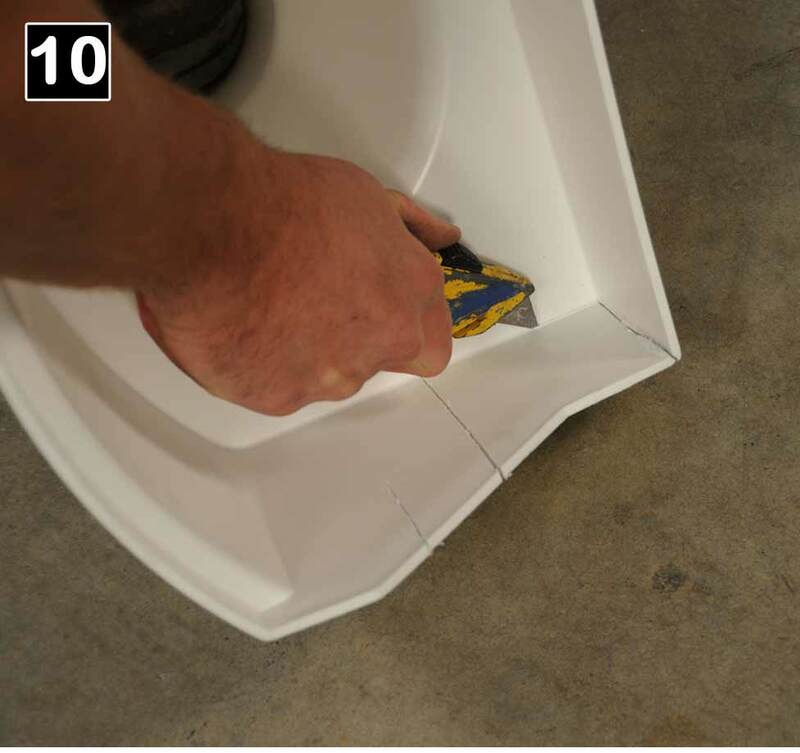 Follow through marking the bottom and the back section of the guttering if possible. 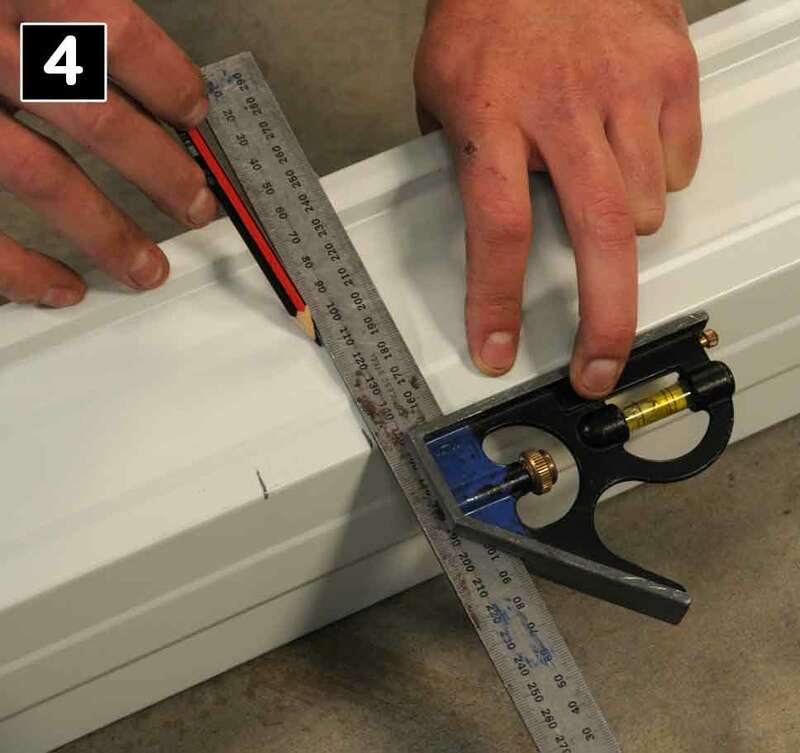 With a hacksaw or tin snips cut out the guttering section by following the marked lines, on both sides, and totally remove that section of the guttering. 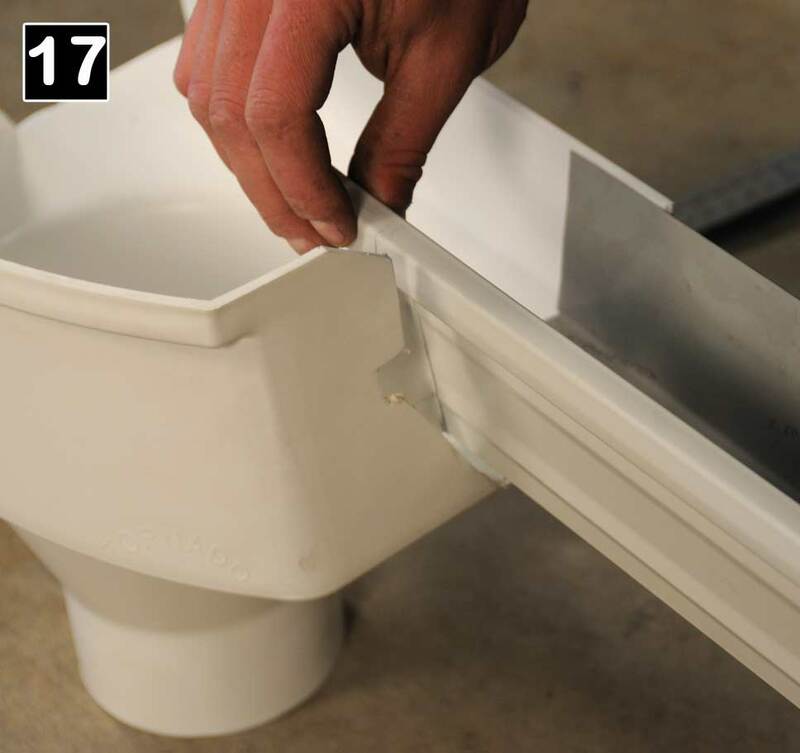 Now take the section of guttering previously removed and insert a gutter clip to maintain the guttering shape. 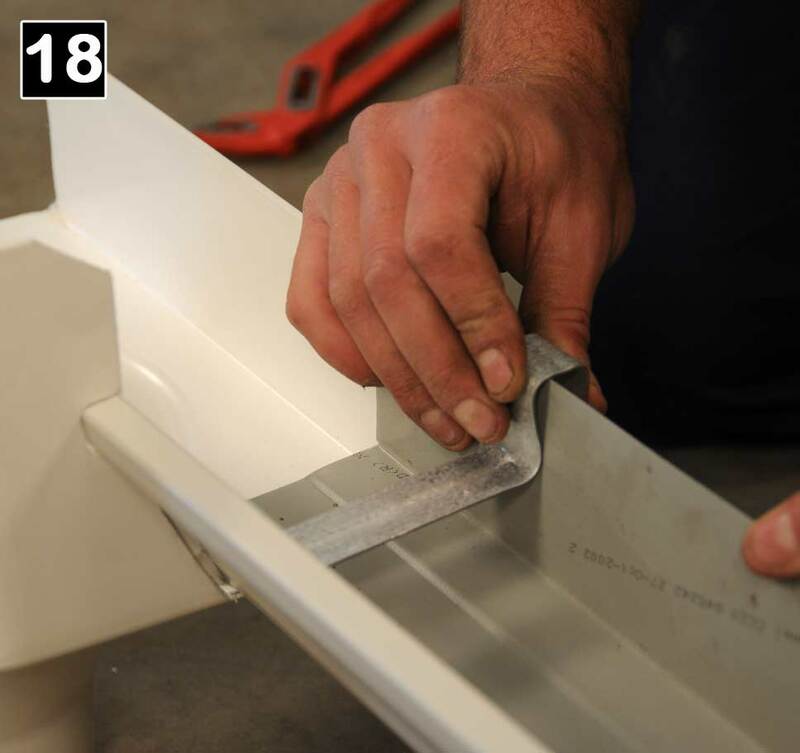 Using the section of gutter as a template, mark around the guttering on each side of the Tornado Inline Rainhead. Ensure it is parallel with, and held square against the back of the guttering. Taking time to mark around the contours of this template will ensure the success of a neatly fitted and finished job. 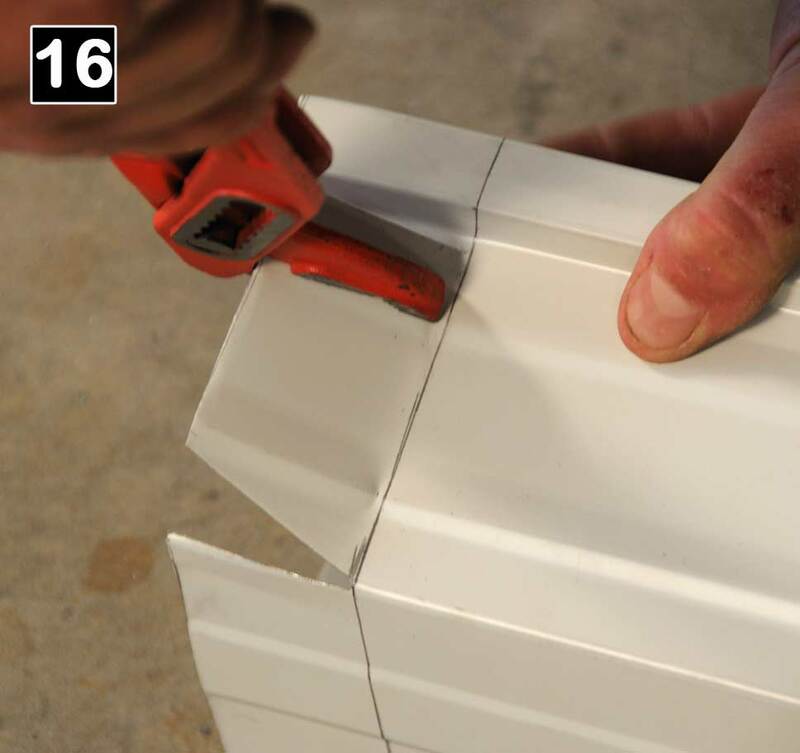 With a hacksaw or tin snips, cut out the plastic section of rainhead on each side, following the marked contours. 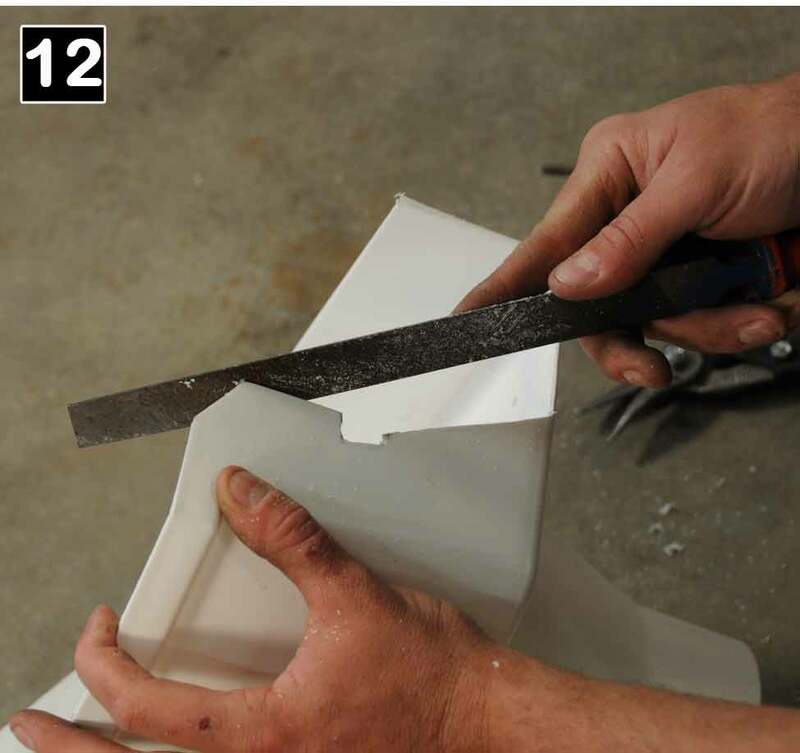 Follow through by cutting vertically down each back corner of the rainhead, and then using a sharp (Stanley type) cutting knife, create a deep score in the plastic along the inside of the bottom of each side of the rainhead. 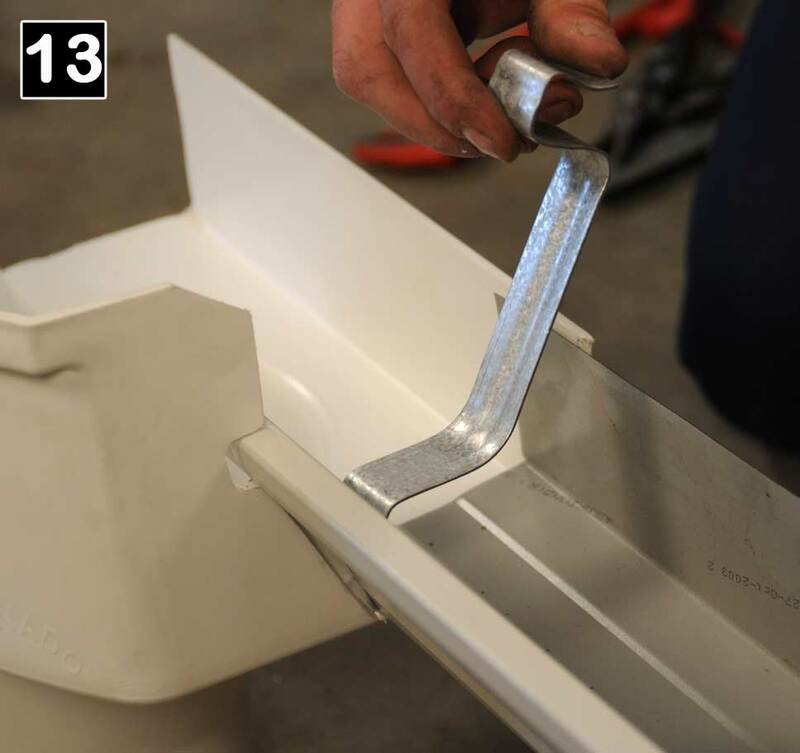 Providing your cutting has been made to the bottom of each side of the rainhead it should now be possible to bend it outwards along the scoring mark, and break the side sections off. 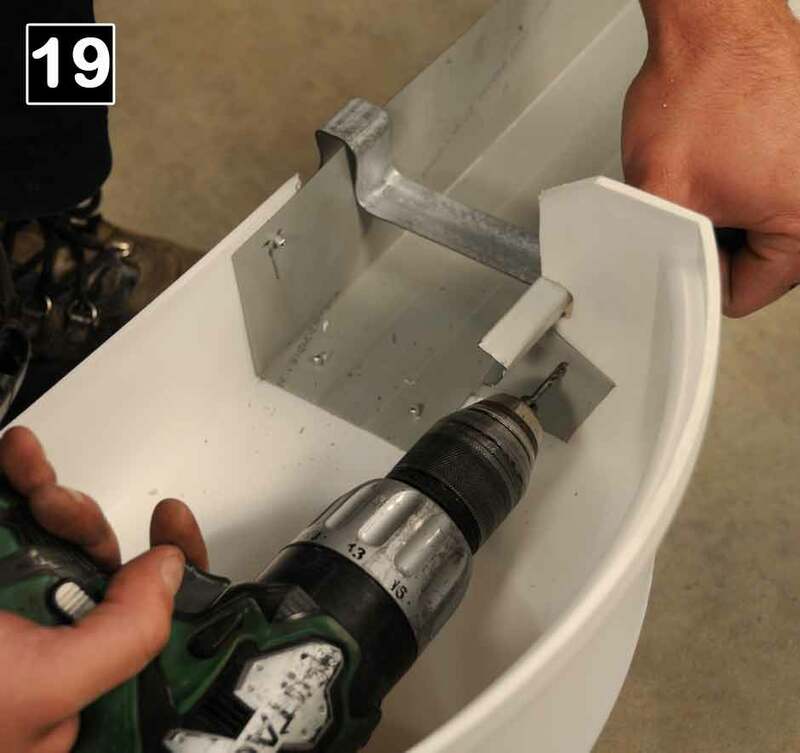 With a standard metal file tidy up and smooth out any imperfections in the cuts on the rainhead. It's now time to check the fit of the rainhead into the guttering. 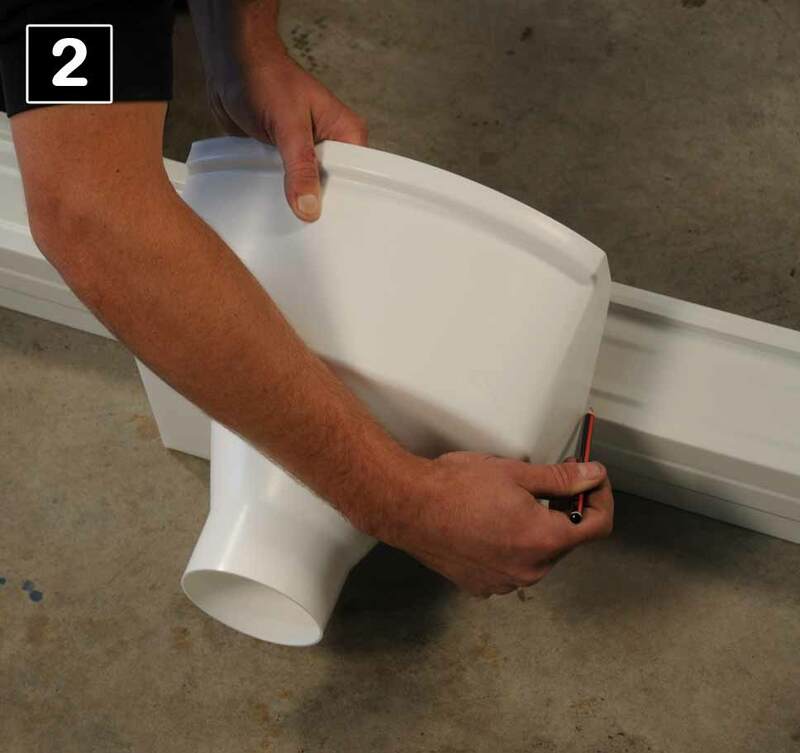 Insert a gutter clip to expand the guttering to ensure it fits snugly inside the cut out section on the rainhead. 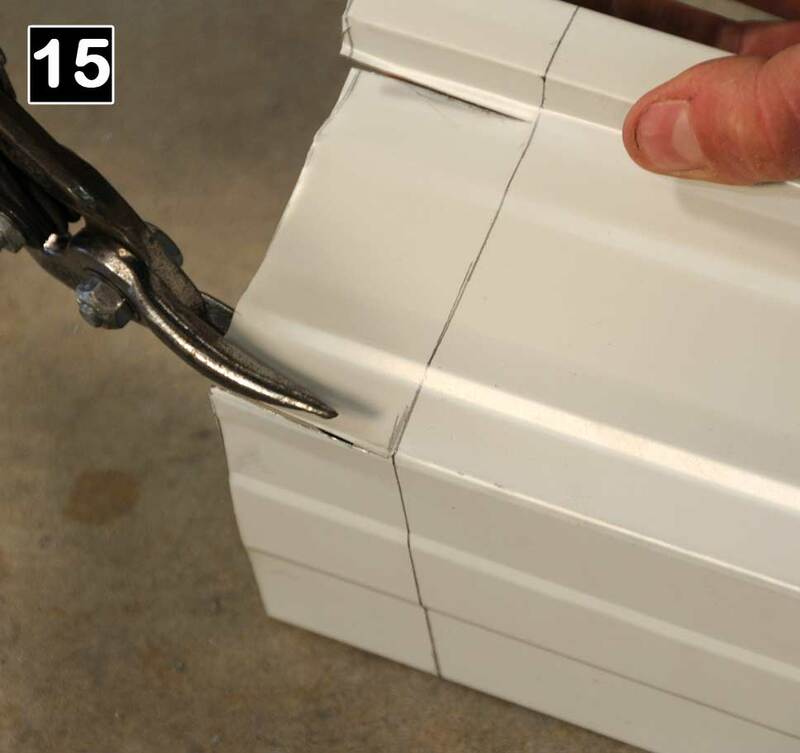 Trim around it or file out any imperfections if necessary to ensure a tight fit. 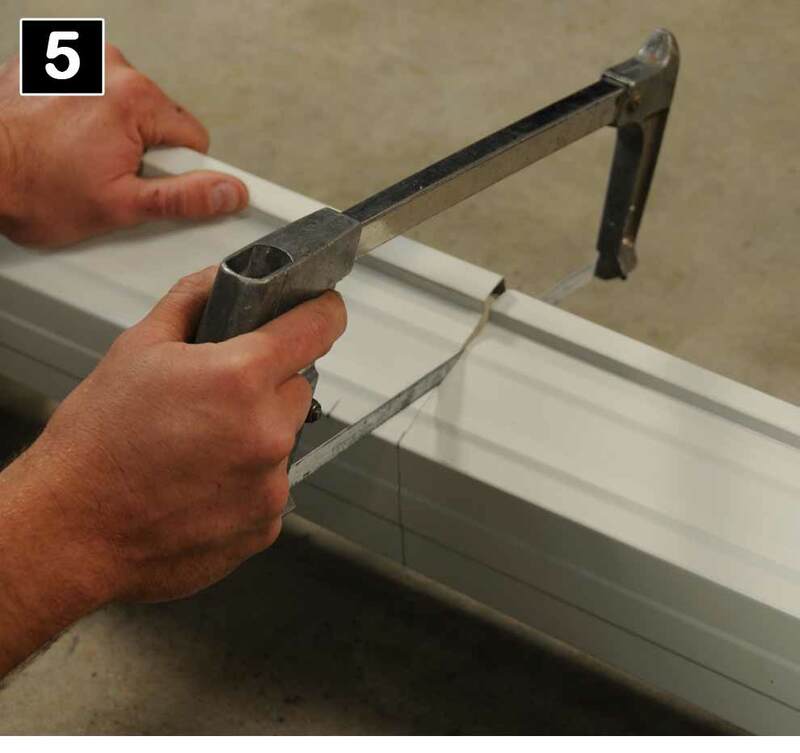 Using a pair of tin snips cut horizontally along the folds of the guttering, back as far as the pencil line on each side. 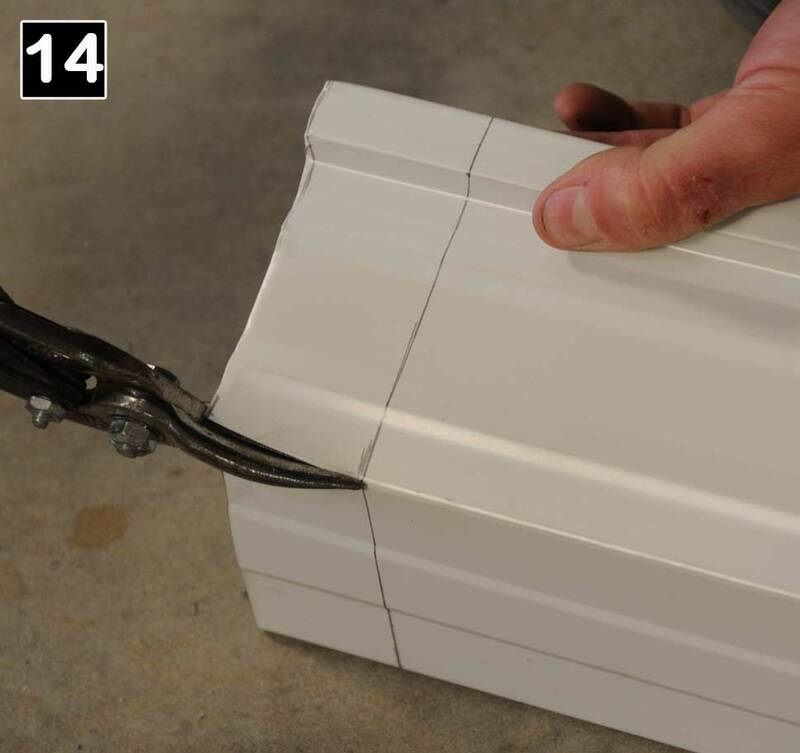 Using your tin snips cut a narrow vee section out (about 15 degrees) from the bottom front of each side of the guttering. It will soon be obvious to you when fitting the guttering inside the rainhead why this is necessary. 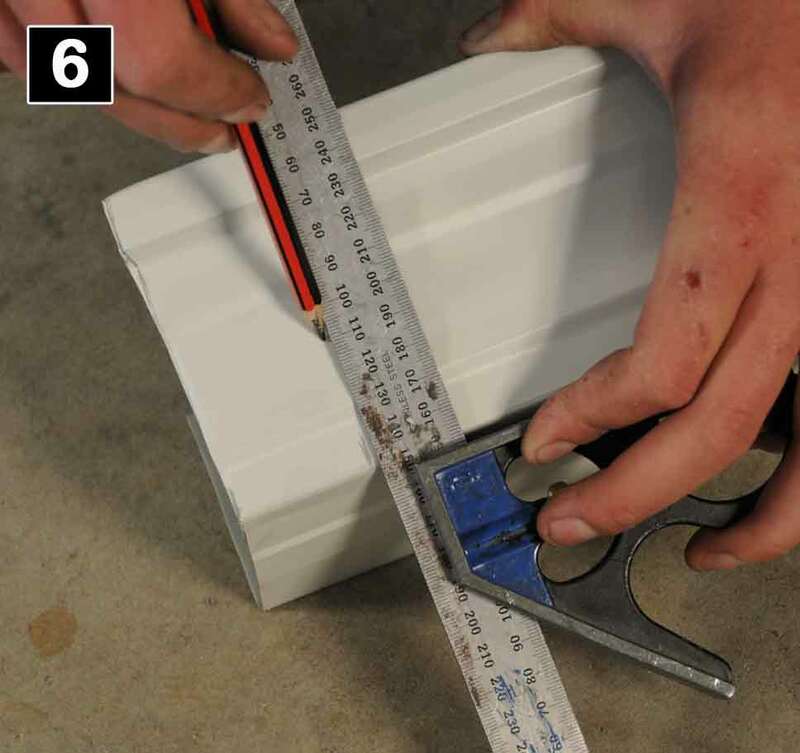 Using a pair of vice grips (or multi grips) to hold and bend the metal, and following the original outer pencil line marking on the front of the guttering, bend the front sections of each side of the guttering outwards 90 degrees, using the original pencil line as the template for the bend. This will allow the guttering to mate up neatly to the inside of the Tornado Inline Rainhead. 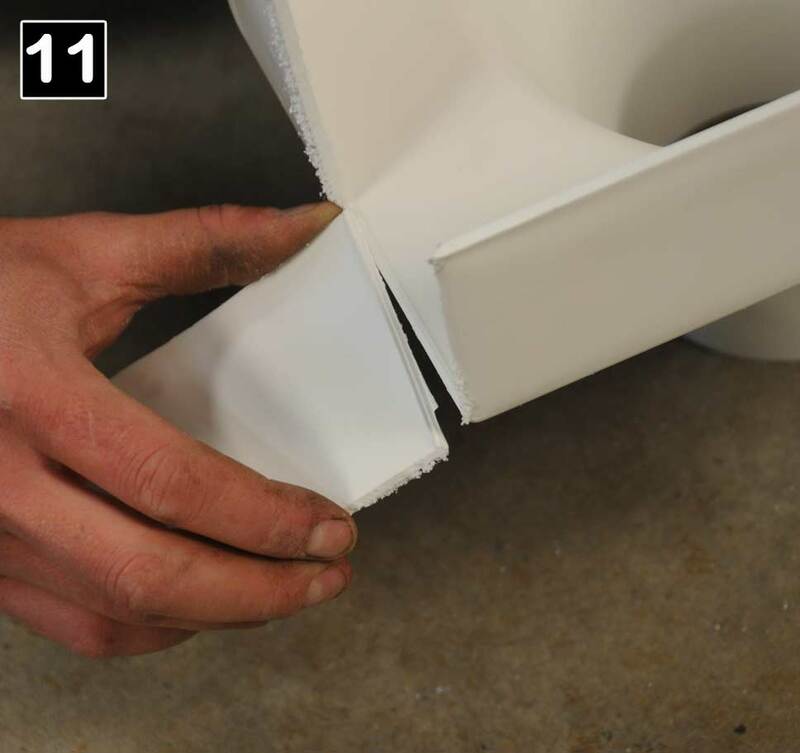 NOTE: It might be necessary, depending on the profile of your guttering to cut out some more (small) vee sections to allow the bends of your guttering to fit neatly, when bent inside the rain head. 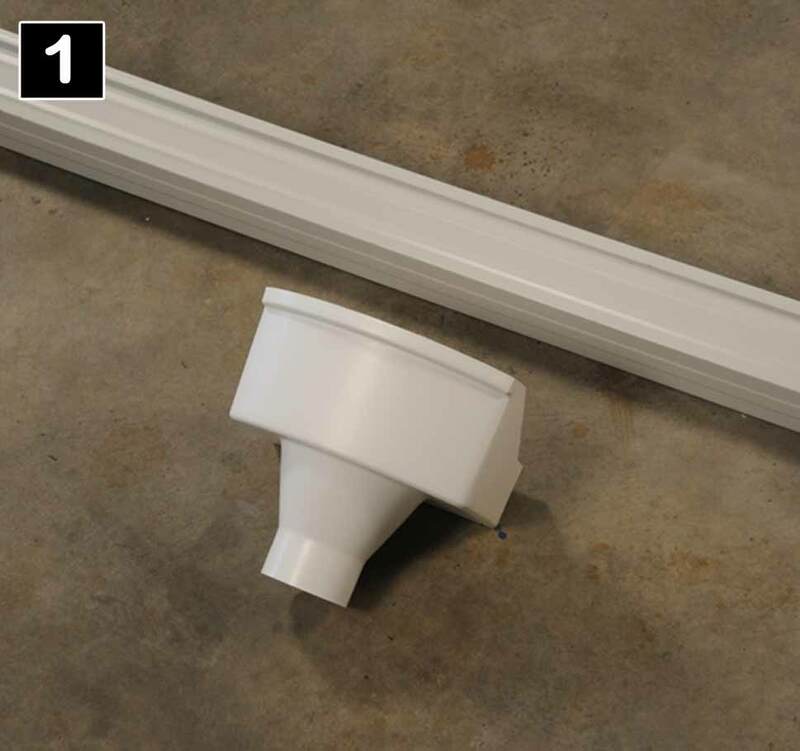 Insert the bent front sections of guttering inside the rainhead - the bottom and back parts of the guttering are not bent - only the front. 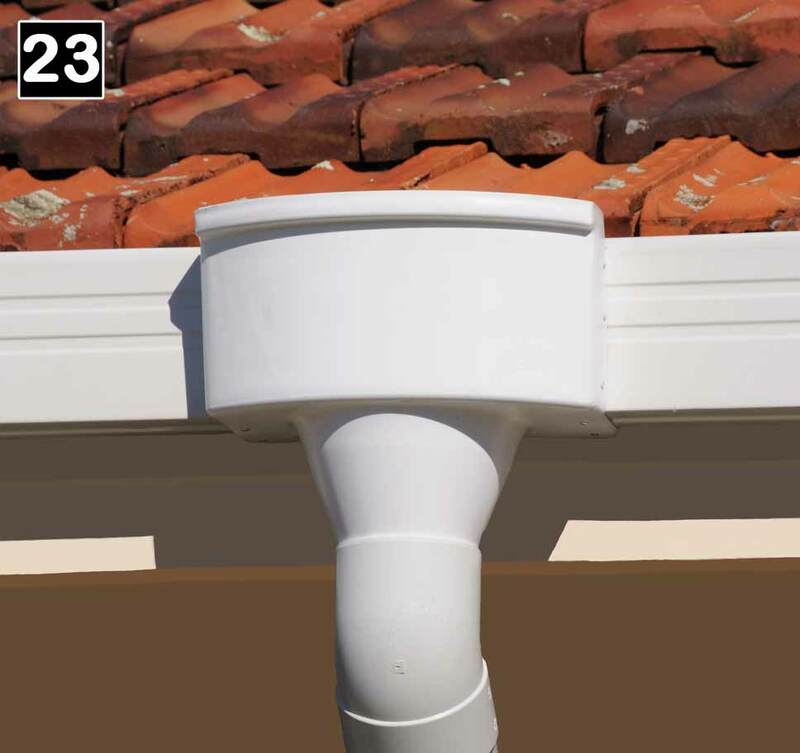 With a gutter clip and if necessary a pair of vice grips, hold the guttering to the rainhead to keep it in position whilst drilling. Using a drill (cordless if possible) and a 1/8" or 3mm drill bit, and a quantity of 1/8" or 3mm x 6mm stainless steel or aluminium rivets. Drill and rivet 3 holes evenly spaced along the bottom, and the back, and then move your vice grips to clamp and hold the bent section securely at the front. Drill and rivet another 3 holes evenly spaced on the inside front edge of the rainhead and securely fasten it to the guttering. NOTE: All of the rivets should be fixed from the outside in. 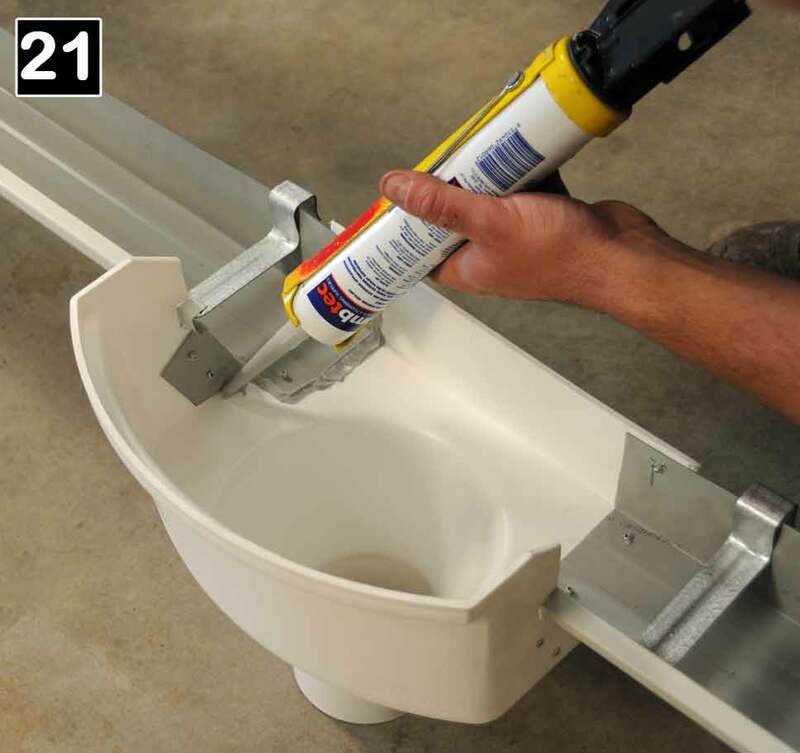 Apply a thin sealing coat of roof and gutter silicone sealer all around the inside joints and over the head of each of the rivets. Your installation of the Tornado Inline Rainhead is now complete. 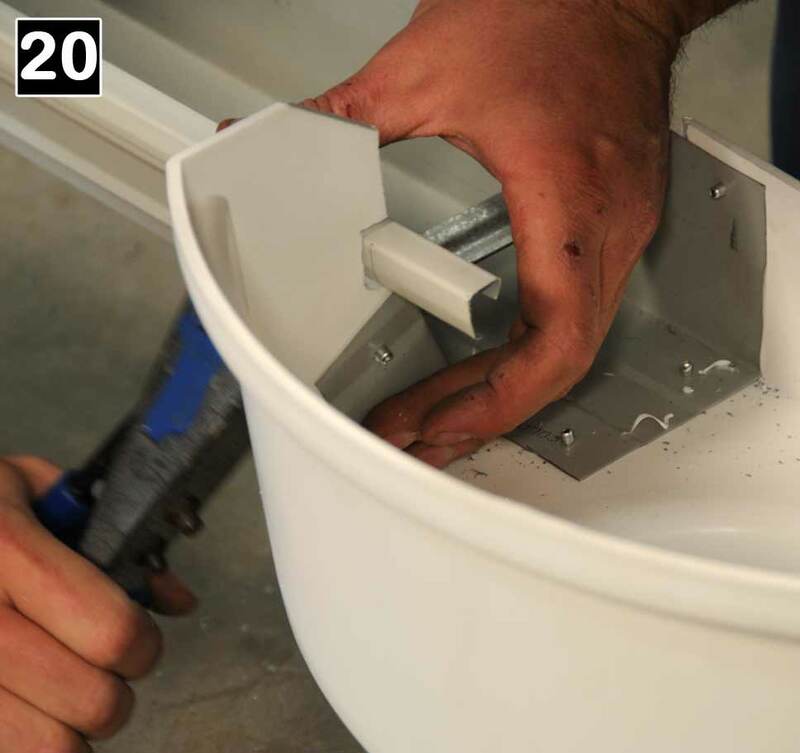 Secure the rainhead in position on the back board or metal fascia using a couple of wood or self tapping screws approximately 25mm down inside the back of the rainhead. 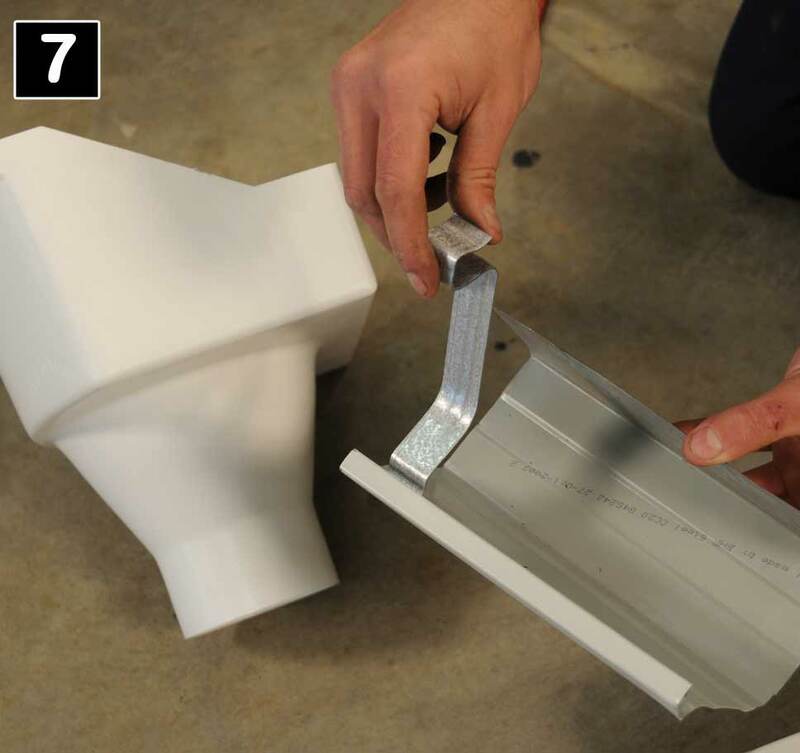 Attach and glue the required 100mm downpipe and necessary bends and clamps before attaching the downpipe to your wall. Your newly installed Tornado Rainhead will now provide you with many years of trouble free service. 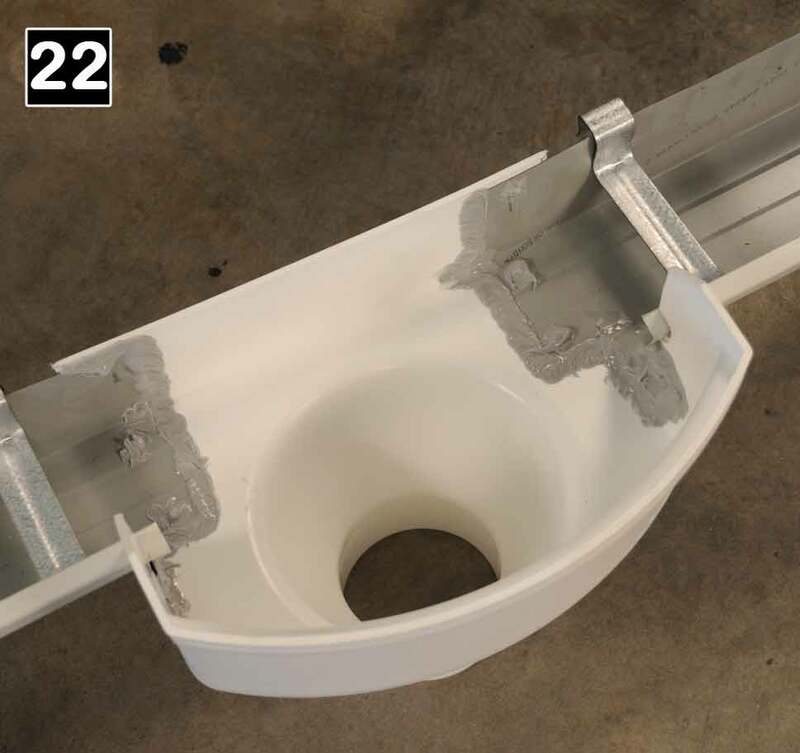 It will not corrode or leak and the Polypropylene is UN treated to ensure of a lifetime of service. 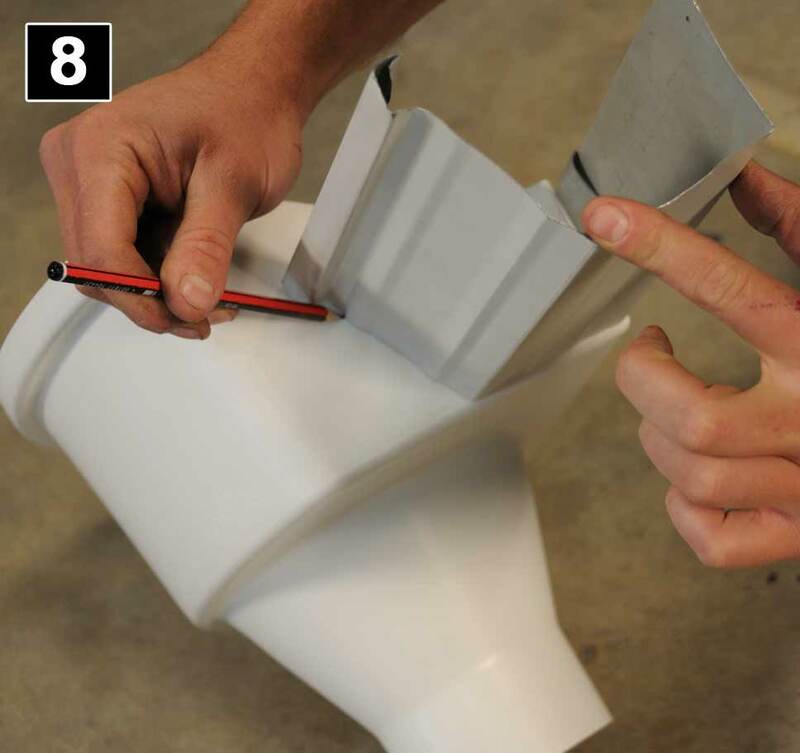 You may now paint the Tornado Inline Rainhead to match your existing or new guttering, with either brush or spray can. 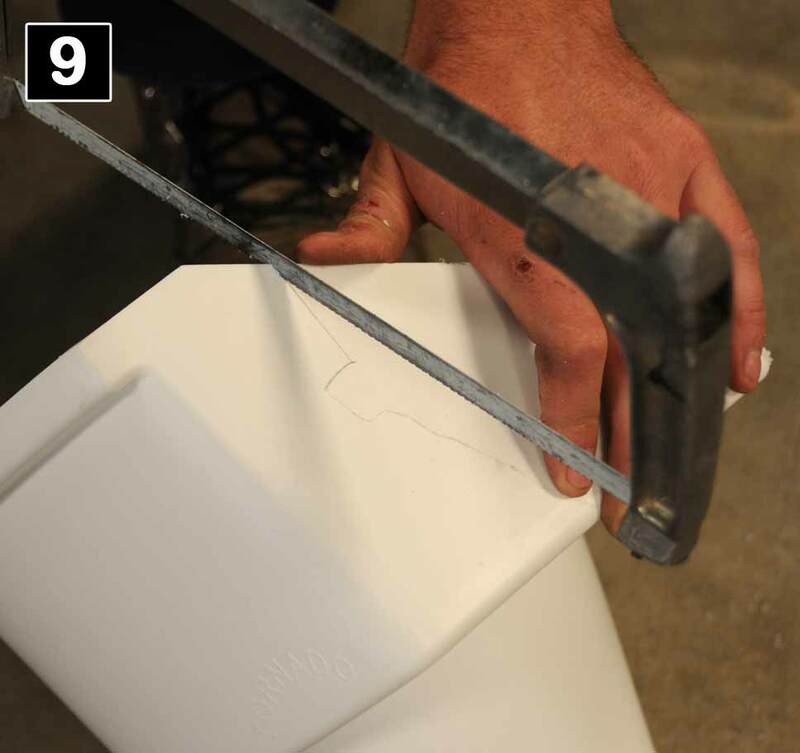 A slight rub back with fine grade sand paper should be considered first as a key before applying paint; the application of a good quality PP plastic primer should be used before applying the finishing paint. 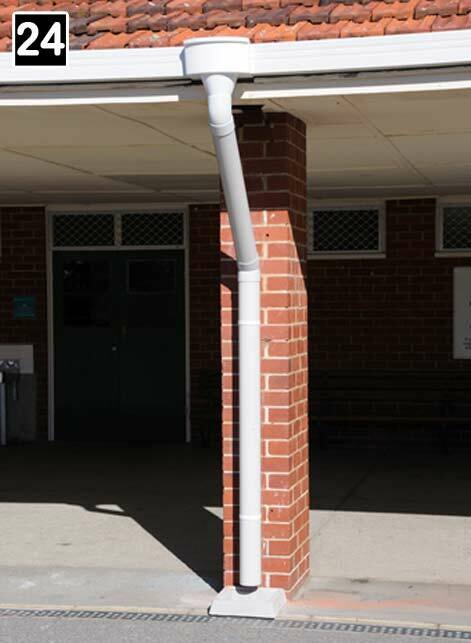 If your guttering is Colorbond - select the appropriate Colorbond paint colour to suit.